In total there are 12 thoracic vertebrae. The presence of costal facet/facets on the sides of their bodies for articulation with the heads of the ribs is how they can be identified or detected. These joints are not found in the cervical lumbar and sacral vertebrae and therefore these joints are characteristic of thoracic vertebrae. The slow increment in the size of thoracic vertebrae is from up to downwards. The bodies of upper thoracic vertebrae is slowly shifted from cervical to thoracic type and those of lower from thoracic to lumbar type. Therefore the body of T-1 vertebra is generally cervical in type and that of T-12 vertebra is generally lumbar in type. Presence of the articular facet(s) on the side of the body is the cardinal attribute of the thoracic vertebrae. Presence of articular facets on every side of the body and on front of transverse processes for articulation with the ribs. Body is heart shaped, especially in the midthoracic region when seen from above. Its transverse and anteroposterior measurements are just about equivalent. Spinous process is long, thin, and pointed downwards. Pedicle is connected to the upper part of the body, so making the inferior vertebral notch deeper. The thoracic vertebra is composed of 2 parts:. The body and vertebral arch enclose a vertebral foramen in which is located the spinal cord encompassed by its meninges. It’s heart shaped, when seen from above. Its anteroposterior and transverse measurements are nearly equivalent. On every side, the bodies are just two costal facets, superior, and inferior. Superior facet is bigger and situated near the upper border of the body in front of the root of the pedicle. 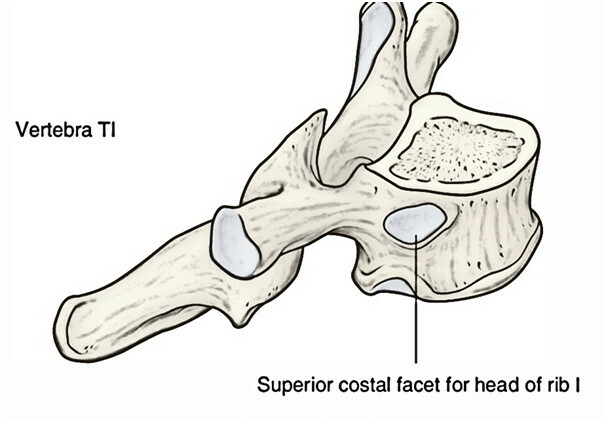 Inferior facet is smaller and situated near the lower border in front of the inferior vertebral notch. The pedicles (left and right) are short rounded bony bars, which project backwards and laterally from the posterior aspect of the body. The laminae (left and right)– every pedicle continues posteromedially as a vertical plate of bone. The laminae of 2 sides join with every other in the posterior midline. The spinous process originates in the midline where the 2 laminae meet posteriorly. 2 transverse processes, 1 on either side originates from the junction of pedicle and lamina. 2 matched articular process, 2 on every side spring from lamina, the superior articular process project quite more from pedicle than lamina, the inferior articular process springs from a lamina. The upper bigger costal facet (really demifacet) articulates with the head of the numerically corresponding rib. The lower smaller costal facet (really demifacet) articulates with the head of the next lower rib. Anterior and posterior surfaces of body supply connection to the anterior and posterior longitudinal ligaments, respectively. These ligaments are connected to both the upper end lower edges of the body. Posterior surface of body is marked by vascular foramina for basivertebral veins, that are covered by the posterior longitudinal ligament. They’re connected nearer the superior border of body, consequently the superior vertebral notch is shallow and the inferior vertebral notch is deep. The deep inferior vertebral notch along with small superior vertebral notch of next lower vertebra finishes the intervertebral foramen, via which spinal nerve leaves the vertebral canal. They can be short, broad, and thick; and overlap every other from above downwards. Their margins give connection to the ligamentaflava. Superior Articular Processes. The articular facets on superior articular process are pointed backwards and somewhat laterally and joint together with the inferior articular facet of the next higher vertebra. The articular facet on inferior articular process is flat and faces forwards and little downwards and medially. It articulates with all the superior articular facet of the next lower vertebra. They can be large weapon shaped and projects laterally and somewhat backwards. The facet on the anterior aspect of the tip of transverse process articulates with the tubercle of the numerically corresponding rib. They supply attachments to the ligaments and muscles associated with the rib cage and back. The spines are pointed downwards and backwards. The spinous processes of middle 4 vertebrae (i.e., from 5th to8th) are quite long, vertical, and overlap every other. The spinous processes of upper 4 and lower 4 vertebrae are comparatively brief and not as oblique in direction. The spinous process of T1 vertebra is the most notable and horizontal in its projection and can be palpated in the back of the root of neck just below the lower end of median nuchal furrow. The spinous process of T8 vertebra is longest. The backward slant falls. At the 11th vertebra, the spine is pointed just about downwards. It’s named anticlinical vertebra, below this level spine slants dorsally and backwards. The spines supply connection to the supraspinous and interspinous ligaments. The spines of middle 4 thoracic vertebrae are nearly horizontal. It resembles the 7th cervical vertebra. The body is narrow anteroposteriorly. Its upper surface is concave from side to side with an upward projecting lip on either sides. The anterior border of inferior surface projects downwards. The superior articular facet on the side of the body is circular and articulates with all the whole of the facet on the head of the very first rib. The superior vertebral notches are deep (i.e., certainly observed) as in cervical vertebra. The inferior articular facet is half (i.e., demifacet) articulates with the head of the 2nd rib. The spinal process is almost horizontal. The lower costal facet on every side of body is absent. The body on every side possesses only superior costal facet (demifacet) for articulation with the 9th rib. The body on every side possesses only single articular facet, that is semilunar or oval for articulation with the 10th rib. The costal facet encroaches on the upper part of the pedicle. Body on every side possesses single large circular costal facet for articulation with all the head of the 11th rib. 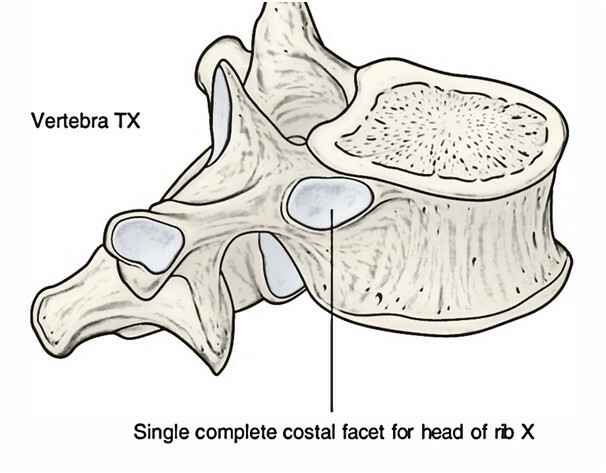 The costal facet goes onto the root of the pedicle. 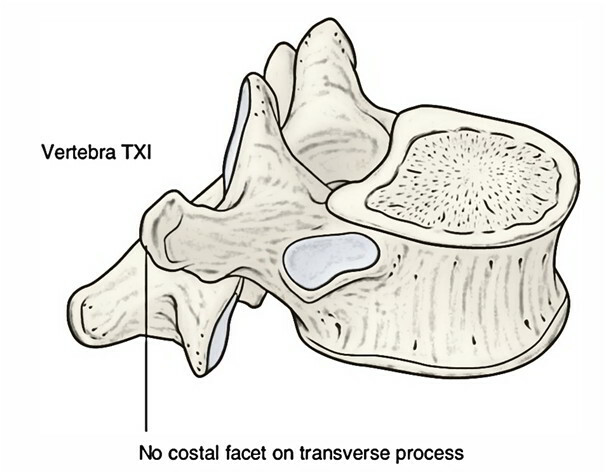 Transverse processes are small and don’t present costal facet on their tips (as 11th rib does not have any tubercle). It resembles the first lumbar vertebra. Body on every side possesses a large single costal facet, that is more on the lower part of the pedicle than on the body. Transverse process is small and presents 3 tubercles– superior, middle, and inferior. It’s no articular facet (as 12th rib has no tubercle). The 3 tubercles of the transverse process of 12th thoracic vertebra correspond with all these processes of the lumbar vertebra:. Superior tubercle corresponds to the mamillary process of lumbar vertebra. Middle tubercle corresponds to the true transverse process of lumbar vertebra. Inferior tubercle corresponds to the accessory process of the lumbar vertebra. Distinguishing features atypical thoracic vertebrae. The costal cartilages are created from hyaline cartilage and are primarily in charge of supplying elasticity and freedom of the chest wall. First to 7th cartilages attach the various ribs with the lateral border of the sternum and they grow in length from 1st to 7th. Eighth to 10th cartilages at their anterior ends are joined with the lower border of the cartilage above and there’s a slow decline in length from 8th to 10th. Eleventh and 12th cartilages finish in free pointed extremities.